What guidance is there available on assessment? What do the Department for Education and Ofsted say about assessment? What does the Department for Education and Ofsted say about assessment systems? Where can my school get advice on writing a whole school assessment policy? When do I need to have found a replacement for Levels? What are the benefits of assessment without levels? What should I be assessing in Computing? Where can I get further guidance on formative and summative assessment? Formative assessment in the context of Computational Thinking? How do I assess learners’ attainment in Computing? Achievement of learners in school – how can I demonstrate progression? What do we need to consider when presenting attainment and progression? Is there an expected format for recording and reporting attainment and progression to Ofsted? What do I do with all my old assessment data from the previous national curriculum and system of levels? Computing is a practical subject and unplugged activities are great but what evidence do I need during an inspection? As with any subject in the National Curriculum, there are big changes to assessment. The system of levels has been abolished and there are no plans for these to be replaced. How schools choose to assess, record and report learners’ attainment and progression is up to each school. Watch the Rising Stars and Hodder Education video presentation that provides an overview on Assessment without levels, then read the FAQ guidance available from Innovate My Curriculum to provide a Computing context for progression in a system of assessment without levels. Read the latest guidance published by the Department for Education NAHT, Ofsted and SSAT. For a list of documents and where to download them, see the further reading section at the end of the document. "Assessment is an integral part of teaching and lies at the heart of promoting pupils’ education. It should provide information which is clear, reliable and free from bias." "There are three main forms of assessment: in-school formative assessment, which is used by teachers to evaluate pupils’ knowledge and understanding on a day-to- day basis and to tailor teaching accordingly; in-school summative assessment, which enables schools to evaluate how much a pupil has learned at the end of a teaching period; and nationally standardised summative assessment, which is used by the Government to hold schools to account." "Good schools have always tracked their pupils’ progress and Ofsted will expect to see this continue. We will not endorse any particular approach. But we do expect every school to be able to show what their pupils know, understand and can do through continuous [formative] assessment and summative tests." It is important to demonstrate that continuous formative assessment and summative tests are used to check what learners have learnt. The data gained from this process (without burdening teachers with unnecessary workload) is then used to improve the quality of planning and teaching, which should impact directly on the attainment of learners to ensure that they are on track to meet end of Key Stage expectations. assessment information is gathered from looking at what pupils already know, understand and can do, and is informed by their parents/previous providers as appropriate in the early years. assessment information is used to plan appropriate teaching and learning strategies, including to identify pupils who are falling behind in their learning or who need additional support, enabling pupils to make good progress and achieve well." "Ofsted will not expect to see any particular type of assessment system in a school. It is important that each school develops a system that is consistent with its own curriculum and supports effective teaching and learning. In addition, Ofsted is also clear that it does not expect performance data to be presented in a particular format. Data should be provided to inspectors in the format that the school would ordinarily use to monitor the progress of its pupils." teachers use any assessment for establishing pupils’ starting points, teacher assessment and testing to modify teaching so that pupils achieve their potential by the end of a year or Key Stage; inspectors should note that Ofsted does not expect to see any particular system of assessment in place." teachers make consistent judgements about pupils’ progress and attainment, for example within a subject, across a year group and between year groups." Page 9 of the ‘Principles of assessment’ published by the SSAT highlights that whilst schools are designing their new assessment systems they must focus on how they plan to use any data collected to improve learners outcomes because this will help schools to collect the right data, the right amount of data and in the right way, as well as having the additional benefit of not over burdening teachers workloads. "A focus on ‘data-driven decision-making’ that is in vogue in many schools today can be unhelpful; it directs attention to the data that are being collected rather than the decisions that the data will help inform. When we are focusing on the data, a number of potential problems arise. First, we tend to regard any piece of data as potentially useful – but the result is often large amounts of data for which we have little use. Second, even when the data are useful, if they have not been collected in a way that supports their immediate use, then it can often be time consuming to get the data in a form that can be used. The result is the information arrives too late to inform the decisions it is intended to support. the right data for the decision at hand, the fact that the data are available can result in the data being used just for convenience. Of course this might be sensible, provided that not too much weight is placed on the data. But over time, as the data is routinely used for these decisions, the cautions are forgotten. We start out by wanting to make the important things measurable, and end up making the measurable important. For these reasons, I believe that it is more productive to focus on decision-driven data-collection, rather than on data-driven decision- making. By focusing on the decisions that need to be made, rather than the data, we are far more likely to collect the right data, the right amount of data, in the right way, for the need at hand." It is suggested that senior leaders in schools read the Department for Education Commission on Assessment Without Levels. On pages 25 - 29 it describes generic guidance on writing a whole school assessment policy. Levels from the previous National Curriculum will be used for the last time in end-of-Key-Stage assessments in summer 2015. From September 2015 schools will need an alternative to levels in place. "By no longer grouping pupils according to levels, teachers can give more focus to providing pupils with feedback which clarifies those aspects of the curriculum where their knowledge and understanding is secure and those areas where there are gaps. Applying a range of formative assessment methods allows teachers to tailor their assessments to the underpinning knowledge and skills being taught, for example by supporting teaching with "effective question and answer" techniques. Removing the ‘label’ of levels can help to improve pupils’ mind-sets about their own ability. Differentiating teaching according to pupils’ levels meant some pupils did not have access to more challenging aspects of the curriculum. In reviewing their teaching and assessment strategies following the removal of levels, teachers can aim to ensure they use methods that allow all pupils access to the whole curriculum." "Assessment without levels gives schools the opportunity to develop their own approaches to assessment that focus on teaching and learning and are tailored to the curriculum followed by the school." "Focusing assessment on the content of the school’s curriculum will allow for communications with parents and carers to provide a clearer sense of how to support their children to build and consolidate learning." "Assessment and pedagogy are inextricably connected. Assessment of pupils’ attainment and progress should be directly linked to the curriculum followed by the school. Tailoring assessment without levels to the curriculum will allow schools to focus on high quality teaching and learning, improve measuring of progress and allow for communications with parents and carers to provide a clearer sense of how to support their children to build and consolidate learning." Whether schools choose to assess learners’ attainment and progression by the National Curriculum Programmes of Study or at a more detailed level using the Computing Progression Pathways, the important thing is to appropriately record progression over a sustained period of time. "The recording of learning outcomes is done in recognition of the importance in monitoring progression over a sustained period of time. In order to effectively record progression in computing, the computational thinking concepts used by the students and the classroom techniques used by the teacher to facilitate learning require periodic auditing." These sources of guidance suggest that over a period of time, it is important to build a holistic understanding of how learners apply Computational Thinking skills to a range of classroom activities as well as their knowledge, understanding and skills. This makes it possible for teachers to identify patterns in the activities in which learners struggle to complete successfully (or vice versa). By recording the associations between the activity and the Computational Thinking opportunities during the planning process, it is possible to identify ‘indicators’ or ‘predictors’ for the Computational Thinking skills where learners appear to be weaker (or stronger) which can be in turn used to improve learner outcomes. This report gives further details of the types of in-school formative, in-school summative and external summative assessments together with benefits to learners, parents, teachers, and school senior leadership of each type of assessment. This information can be found on pages 18 - 21. "We shouldn't want [formative assessment] because research shows how it improves learning (we don’t need to be told that – it has to be true). We should want it [formative assessment] because schools are places where learners should be learning more often than they are being selected, screened or tested in order to check up on their teachers. The latter are important; the former are why schools exist’ (Silcock, 1998)." Applying the question of balance between formative and summative assessment to the context of Computing; listening to the Computing education community there is an opinion amongst some teachers that finding summative assessments that are both appropriate for less able learners but are also sufficiently open end to challenge the most able learners, is a challenge. There is a risk that summative assessments could be differentiated by task, preventing some learners from attempting more challenging work. "Schools have the freedom to choose their own approaches to formative and summative assessment, according to what best suits their pupils, [subject] curriculum and staff. This provides an opportunity for schools to challenge and improve their assessment systems and to build greater expertise in assessment". There are different methods that can be applied in Computing lessons to formatively assess learners’ competences i.e. knowledge, understanding and skills. For further guidance on this, read the Department for Education Commission for Assessment Without Levels. In the context of Computational Thinking, formative assessment could involve observing and discussing with learners, or written justification of how they approached a particular problem. For example, learners explain and justify the process they went through and the design choices they made (i.e. based on their use of Computational Thinking). 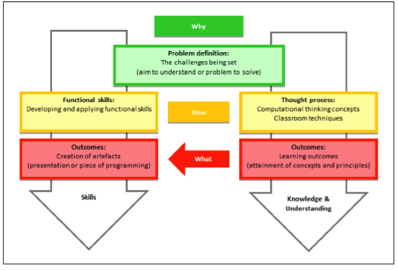 However, this will only provide a snap shot of how learners applied Computational Thinking to that specific problem. This is no guarantee that they will demonstrate the same competency in future activities that require similar Computational Thinking skills to be applied. Developing a holistic understanding of the learner’s Computational Thinking capabilities over a sustained period of time can make the use of formative assessment more useful as a predictor of the types of activities where the learner is likely to struggle e.g. abstraction, and makes any interventions more targeted and timely. In time, this should reflect in an improvement in the learner's capability and attainment. assessment information is used to plan appropriate teaching and learning strategies, including to identify pupils who are falling behind in their learning or who need additional support, enabling pupils to make good progress and achieve well. except in the case of the very young, pupils understand how to improve as a result of useful feedback, written or oral, from teachers." Consider the artefact against the intended Learning Outcome. If it demonstrates different learning outcomes than you intended, does the learner justify what they did? Is there a gap in the learner’s knowledge, understanding and skills or are they actually exceeding expectations (that is, choosing which concepts and principles to apply)? This will enable you to make a judgement based on the learner's learning profile. If you are marking an extended piece of work e.g. a project, is the artefact produced fit for purpose against the hook of the project i.e. the 'why'. "Ensuring assessment directly evaluates pupils’ knowledge and understanding of curriculum requirements helps to create a virtuous circle of teaching and assessment. Teachers assess pupils’ understanding of a topic and identify where there are gaps." For further guidance that applies this model of assessment to assessing programming activities then one excellent source of reading is the CAS QuickStart Secondary Computing section entitled How do I assess programming? "Teachers receiving new pupils frequently disagreed with the levels those pupils had been given by previous teachers. Consequently, the information secondary schools received from primary schools was sometimes felt to be unreliable or unhelpful." Schools should apply their assessment policy and use transition links to feeder schools to gain an understanding of what their learners already know, understand, and can do. Similarly, it is the responsibility of feeder schools to work with the schools they supply learners to, to understand what their learners future educational needs are and plan their curricular accordingly. With this assessment without levels data (focus on what learners’ know, understand and can do) they can then begin teaching learners from the appropriate learning statements from the Computing Progression Pathways. For learners entering schools at Key Stage 2 or 3, until continuity is developed between the receiving school and the feeder schools, some in the educational community advocate the use of Baseline assessments, such as the free Hodder Education or Naace and TLM Baseline assessments. assessment information is gathered from looking at what pupils already know, understand and can do, and is informed by their parents/previous providers as appropriate in the early years"
Schools could investigate the Baseline assessment tool that is most suitable for their curriculum and learners. Using the Hodder Education Baseline assessment as an example, test learners’ knowledge and understanding of the content from the Key Stage 1 and Key Stage 2 Programmes of Study. These questions are mapped to the Computing Progression Pathways and National Curriculum Programmes of Study, so that teachers can use this understanding of learners’ capabilities as a starting point, and can then monitor their attainment through formative and summative assessments during the Key Stage to demonstrate progression. Some Primary schools have used Key Stage 3 Baseline assessments to test learners on the Key Stage 1 and Key Stage 2 content from the Programmes of Study. Some learners may need support with reading these questions. However a quick search on www.yacapaca.com found other free alternatives to the providers suggested in this guidance. It should be noted that Baseline assessments are currently useful for the subject knowledge content in the Programmes of Study but don’t currently assess Computational Thinking capabilities. To begin assess learners’ Computational Thinking capabilities at Key Stage 3 many teachers recommend using the free UK Bebras challenges which are also mapped to the Computing Progression Pathways. "levels were often the main focus of conversations with pupils and their parents or carers" and goes on to say "The disconnect between levels and the content of the national curriculum also meant that telling a parent his or her child was level 4b, did not provide meaningful information about what that child knew and understood or needed to know to progress." "Without levels, schools can use their own assessment systems to support more informative and productive conversations with pupils and parents." "the school’s engagement with parents, carers and employers helps them to understand how children and learners are doing in relation to the standards expected and what they need to do to improve"
Is there an expected format for reporting attainment and progression to parents and carers? "Ofsted does not expect performance and pupil-tracking information to be presented in a particular format. Such information should be provided to inspectors in the format that the school would ordinarily use to monitor the progress of pupils in that school." "In 2014/15, most schools, academies and free schools will have historic performance data expressed in national curriculum levels, except for those pupils in Year 1. Inspectors may find that schools are tracking attainment and progress using a mixture of measures for some, or all, year groups and subjects." The use of unplugged activities (teaching Computing without computers) is growing more and more popular in schools. Furthermore, programming is a skill, and feeding back to learners on the code they write can be a time consuming task. Therefore, some teachers are uneasy about what evidence of learning and evidence of feeding back to learners Ofsted would expect to see during an inspection. "Ofsted does not expect to see a particular frequency or quantity of work in pupils’ books or folders. Ofsted recognises that the amount of work in books and folders will depend on the subject being studied and the age and ability of the pupils. While inspectors will consider how written and oral feedback is used to promote learning, Ofsted does not expect to see any written record of oral feedback provided to pupils by teachers. If it is necessary for inspectors to identify marking as an area for improvement for a school, they will pay careful attention to the way recommendations are written to ensure that these do not drive unnecessary workload for teachers." CAS QuickStart Secondary Computing, How do I assess programming?